KEEP IT SIMPLE: The Acer Travelmate P645 is a fuss-free workhorse. 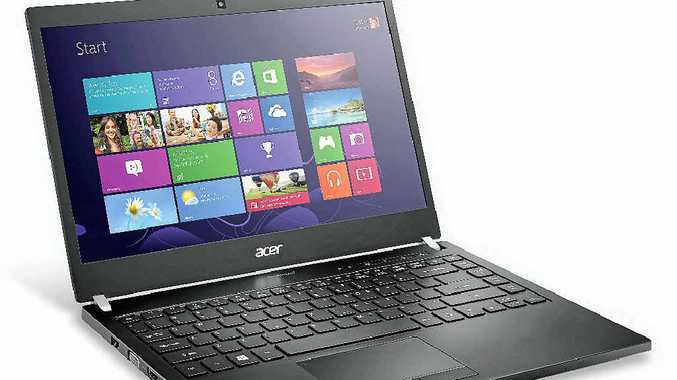 THE Acer Travelmate P645 is a simple laptop that picked its job and does it well. There aren't a lot of gimmicks here - there's no touch screen, it doesn't flip around and there's no detachable keyboard. Fortunately for the bits that are here, they're all done properly, with a level of grace missing from many modern laptops. While the P645 performs surprisingly well in its class for gaming, it's really a business workhorse that won't get in your way during crunch time. The Intel Core i7-4500U processor belongs to Intel's faster series of processors but trades performance for a huge jump in battery life. A day of continuous surfing the web and writing reviews saw the P645 last a few minutes over 10 hours. The 14" monitor runs at proper 1080p HD (1920 x 1080) but the tight frame makes it feel like you're getting a lot of screen real estate without taking up a lot of space. Pixels are pushed by a respectable Radeon 8750M card that has purpose-built go-fast-gear for viewing movies and can run modern games at medium settings - a decent feat for a device you can fit in a large handbag. The wireless card and network capabilities were solid and worked straight out of the box. Switching between networks was also easily accomplished. There's an HDMI and a VGA port for external displays and a comfortable three USB 3.0 ports. Headphone and microphone jacks are easily accessed. There's also an SD card slot for those using the P645 as a field laptop. The keyboard and track pad aren't revolutionary but they do work very well. The P645 is built for security. They've included a fingerprint reader for that inevitable day when we drop passwords for potentially more secure biometric authentication. The fingerprint reader is wired into the lowest levels of the laptop, so the whole thing can be secured using their ProShield software from making sure nobody logs in to determining what ports can be used by which users. In short, you're more likely to get your IT department to let you have this laptop than most other devices. The ProShield software has a handful of features you won't know you need until something goes wrong, such as easy access to the serial number and methods for putting the hard disk's reading head in a safe position so dropping it has less of a chance of destroying your data. Do yourself a favour and get the "optional downgrade" to Windows 7. The lack of a touch screen means Windows 8 is clunky and awkward compared to its predecessor. The build quality is solid and gorgeous but the hinges, as attractive as they are, feel not as strong as they could be. If you're looking for a work laptop that can handle a bit of fun and travel, there aren't many competitors that have a chance against this. Our tests showed a laptop with great battery life that won't burn through your lap while it rolls through whatever you throw at it.